USB Type-C is the new universal USB connector that replaces the entire plethora of medium, small, and large connectors that are used in your cell phones and your PCs with one small, easy-to-use connector. It’s been adopted very rapidly because it combines ease of use with a much higher degree of flexibility. In the 2015 EMF Survey of Embedded Developers (1,334 responses), 16.5 percent of USB developments were using the USB-C connector. Keep in mind that it’s only been available for a year. This is a huge early response to the USB-C connector. One of the important features of USB Type-C is the alternate mode capability, which permits the use of other high-speed serial technologies the same connector. For example, you can combine USB with DisplayPort, Thunderbolt, or MHL (which is an HDMI like system). This gives the developer/system designer the ability to use one port (and one hole in the plastic) to bring out all the high-speed interconnects. As the industry transitions to Type-C connectors, an increase in product designers’ creativity will result because they can now use one port to connect with various different products. This also gives designers the ability to use standard off the shelf components for things like power supplies. This, in turn, will drive the economies of scale. It’s going to make products cheaper and more flexible consumers. So as companies plan to incorporate and adopt USB Type-C, it’s important to be aware of how substantially this will impact the USB ecosystem. Developers will be able to connect their products to many other products. It’s becoming an even much bigger ecosystem than we had for plain USB. This means most companies will need to work with partners, both on the hardware side (the IP blocks, for example with Cadence) and on the software side (with a system software company like MCCI) because developers will want to focus on what makes their products unique, and what gives them a competitive edge. If a company tries to go it alone, it’ll burn a team of talented engineers for some time period, dealing with the complexity of the specs and with the complexities of interoperability. If companies go with an IP provider (or a team of IP providers), that aspect is taken care of for them. Such partnerships will stand behind the engineering team, allowing them to focus on what makes these products great. CFOs should be wary of incurring internal engineering resource expenses when partnering with other experienced USB vendors can provide cost savings and reduced time to market. There’s clearly connection between USB and the Internet of Things, which has now moved beyond the fad stage. We see a dichotomy between real and “make real” IoT applications (the real IoT goes far beyond remote garage door openers and door locks). Nonetheless, there are differences in how developers design. Based on 1,034 responses to the 2015 EMF Executive Embedded Developer Survey, I established three cadres of developer data: Total Industry Responses, IoT Developer Responses, and Non-IoT Developer Responses. Figure 1 shows what developers plan to use for interconnect technologies. Interestingly, there’s little difference between IoT and non-IoT developments. Nor should there be such, if one thinks about it. This data shows the broad use of USB as an interconnect technology. 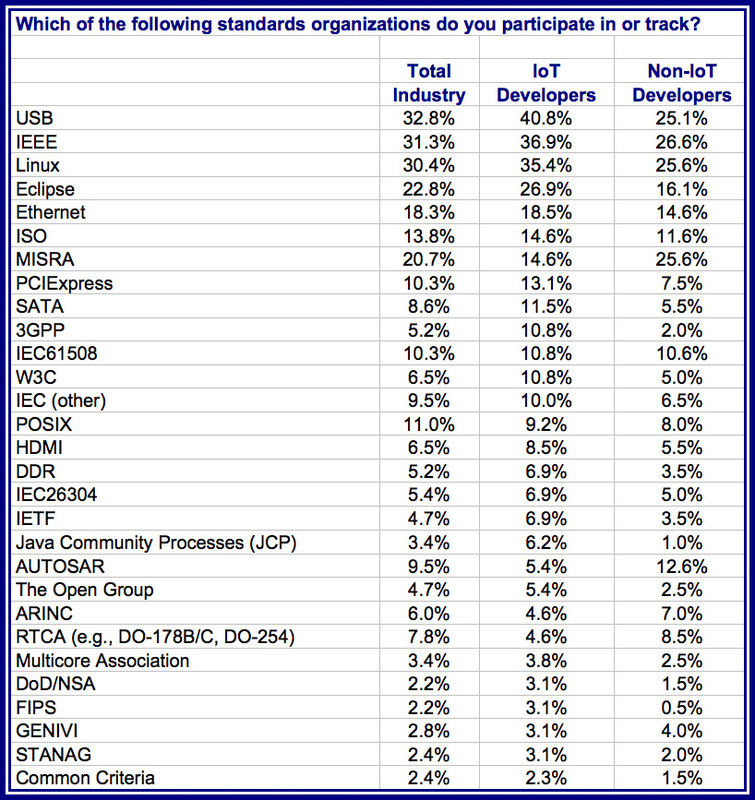 A more telling insight would be to look at which standards organizations are supported by IoT and non-IoT developers. 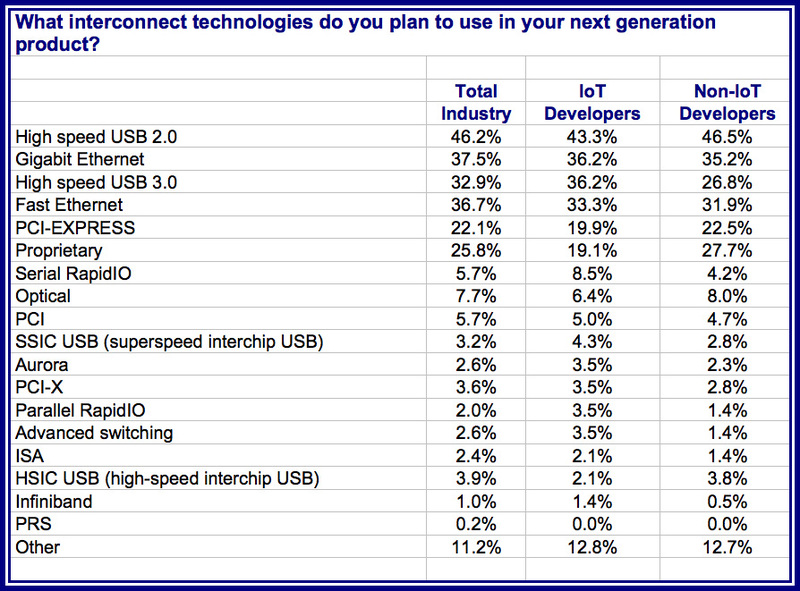 It is interesting that USB is the most followed standard among IoT developers as well as by the embedded industry. Given the substantial use of USB for IoT and non-IoT developments, the Type-C connector should have an impressive impact on interconnect designs and developments.